“Hardworking” was the word of ISKL’s Varsity Boys Football captain Dheer R., as he described the team for the upcoming exchange. The exchange is a small tournament designed by the IASAS schools to face off against each other before the grand IASAS Tournament. This year’s exchange was held on our new campus. The event kicked off on Friday, 14th of September 2018 at 2:20 p.m. and ran through until Saturday, 15th of September 2018 at 6 p.m. 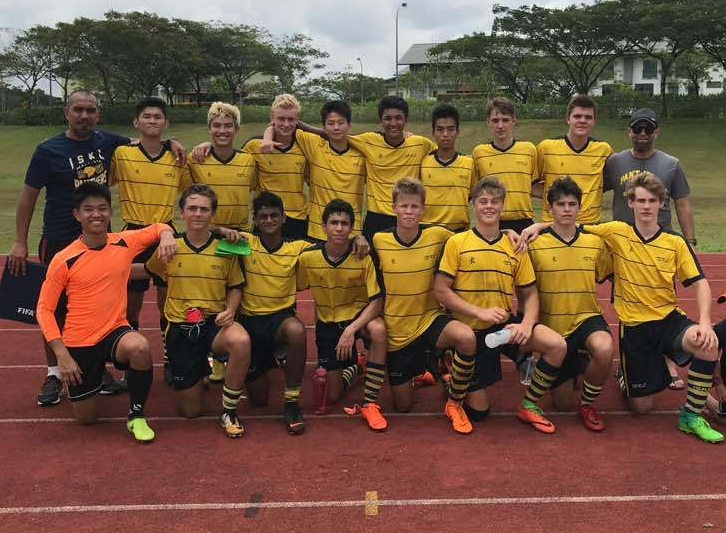 The tournament hosted 4 teams: SAS ( Singapore American School), JIS ( Jakarta International School), and a local sports academy KLYS (Kuala Lumpur Youth Soccer). Along with these responsibilities, Dheer and his team hope to “win the IASAS tournament” and that “it’s the reason the team was put together and it’s what the months of preparation are for.” Winning the tournament is the dream for all IASAS athletes and some previous experience definitely helps. When asked about how long he has played soccer at ISKL and what he takes away with the experience, Dheer says that he has “been on the JV team for one year (sophomore year)” and has “managed to reach the varsity level two times (junior year and senior year). This year is Dheer’s first year as a captain and he seems like he is up for the challenge; willing to push the team to a different height. In order to perform at the exchange, the team needs to be ready to face whatever comes their way. When asked what the team’s preparation was in order to be ready for exchange, Dheer responded that “the team needed to work hard in practice with all the drills including the fitness and to make sure that they aren’t slipping any of the practices. The team needs to be ready to face players that could be fitter and technically better than them but with an extensive effort being put in, ISKL should be the champions of Exchange.” It seems as if every athlete wants to see a gold IASAS medal hanging from their necks, but are they up to the task and will they succeed in finding the gold? Now that I was aware of what the team had and what the team needed, I asked Coach Hutterd what his role as Coach was like: “As Coach it’s all about being able to motivate the team off the field and improve the skills of the team as a whole make sure they’re ready for games, whether it be a passing drill or a fitness run, it’s preparation for the team to perform at their peak” He has been including more training sessions for the team to not lose their fitness and trying to motivate the team to give it all out on the pitch. In conclusion, the team’s result was 1 loss, 1 draw, and a 1 win and although the team didn’t perform the way they hoped, it was a wake-up call. The team realizes that they need to focus on the preparation and the process with great intensity leading up to IASAS, meaning that they need to work hard in practice to show that they are really a team with a great potential to take the IASAS gold home.